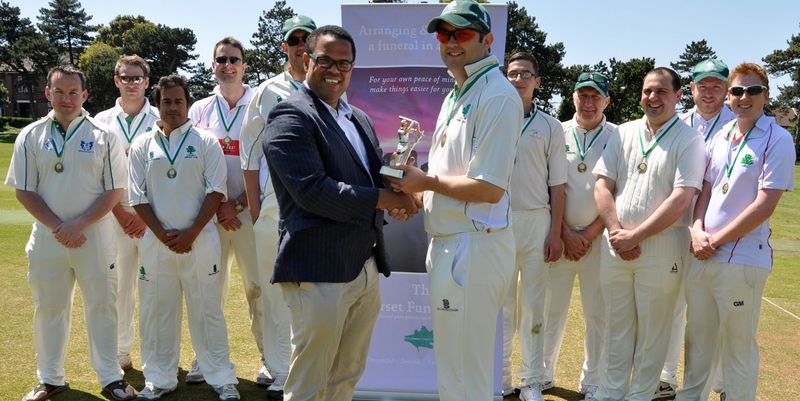 Lytchett Cricket Club picked up the Dorset Funeral Plan team of the month award for May – after a string of big victories. And what makes the achievement greater is that the club are currently nomadic while their home ground is being improved. Nick Douch (left) presents Lytchett CC skipper Trevor Smith with the team of the month award. Lytchett are currently flying high in ‘Division 5 south and east’ and play home games at King’s Park in Bournemouth. The team received a trophy, individual medals and a bottle of bubbly, which were presented to them by Nick Douch from the Dorset Funeral Plan. The award is presented each month during the season for the club throughout the Dorset Funeral Plan Saturday leagues which have achieved success. During May, Lytchett had victories over Witchampton II, Corfe Mullen II, Blandford III and Branksome and Parkstone II. The win over Blandford involved creating a mammoth total of 415 for one, then dismissing the opposition for just 21. Captain Trevor Smith said: “Basically our success in May was down to great opening partnerships and making a lot of runs. Nick Douch said: “I’d like to congratulate Lytchett on being team of the month, especially as they haven’t got a home ground at the moment. “It means a lot of travelling for the players but they’ve come together as a team and had some impressive victories.